The Par-A-Sol Ant Moat is a handy, eco-friendly solution to keep ants out of your nectar. 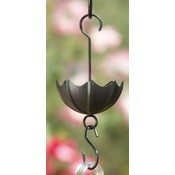 Just hang the umbrella shaped from the included hook, fill with water and hang your feeder below. The ants become trapped and will not cross the moat. Dimensions: 3" x 6".